By virtue of their position, generals garner the fame – or the infamy. But no general succeeds without a solid staff behind him. For most of military history, staff officers were chosen by their commanders, often with few qualifications. In the Napoleonic and Freidrichian eras, staffs were often populated by nepotism and cronyism, often to the detriment of performance. The Civil War was no exception to this rule. Stonewall Jackson famously selected men of the cloth, perfering devotion to martial experience. Ulyssses S. Grant favored men from his old home town of Galena. John A. Rawlins proved a solid choice, but Clark B. Legow? Perhaps less so. In fact, every shrewd general keeps a weather eye out for intelligent, promising officers who cross his path. William Starke Rosecrans was no exception. 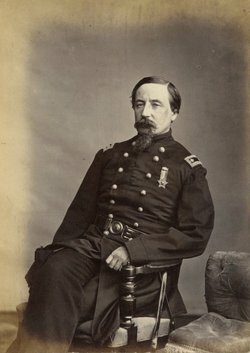 In the fall of 1862, One such path-crosser was Lieutenant Colonel Arthur C. Ducat of the 12th Illinios. Ducat’s energy, intelligence, bravery and military knowledge all made a favorable impression on Rosecrans. Ducat was born in 1830, in Dublin Ireland, to parents of Scots descent. His family was well-off, at least until his father died unexpectedly in 1842. Thereafter the family fortunes declined. At aged 15, Ducat was apprenticed to a mercantile firm in Dublin. He did not take to being a merchant. He returned to school for two years, studying civil engineering. His next career choice, however, was unusual: he enlisted in the Duke of Cambridge’s own Regiment of Lancers (the 17th.) Health reasons invalided him out of the British cavalry within a year, however. This was probably a lucky stroke for Ducat, for the 17th would later earn fame as one of the regiments in the light brigade at Balaclava. In 1850 Ducat journeyed to New York. He had little money, but his timing was good. The great American railroad boom was beginning, and his civil engineering skills could be put to profitable use. Railroad business took him to Chicago. He worked in Illinois and Wisconsin for the next few years, building the Fox River Valley Road and the Chicago and Northwestern line. In 1856, however, he changed careers again, going to work for an insurance agent, Mr. Julius White. Here his organizing talents came into play. Ducat became very interesting in organizing and improving Chicago’s volunteer fire companies. In fact, Ducat went much further, urging the city to form professional fire companies and acquiring the newest steam fire engines; all to the dismay of the volunteers. For a time, it was said, Ducat was the most unpopular man in Chicago. Then the first Great Chicago Fire (yes, there was more than one) came in 1857, and did so much damage to the business district that it convinced Chicago to adopt Ducat’s ideas. Ducat would become the first captain of the Chicago Fire Brigade, and in many ways can be regarded as one of the CFD’s founders. Most of the various volunteer companies and the fire brigade took their organizational qeues from the militia, and so adopted a semi-military aspect. Ducat, not content to stop there, however, also joined the Highland Guard, a ceremonial militia and drill company of Scotsmen, based in Chicago. Never willing to be a mere dilettante, Ducat was soon voraciously reading military tomes of all kinds. With the outbreak of war, Ducat strained to put those hard-won skills to good use. The Highland Guards offered their services to the state, but Ducat, impatient, decided to raise an independent force of pioneers, engineers and mechanics. He recruited 300 men, but neither the state of Illinois nor the Federal government saw a need for this sort of specialized force at the time, and refused the offer. Interestingly enough, most of Ducat’s defacto battalion instead enlisted as Company G, the 19th Illinois Infantry, later to become Bridges’s Battery of Illinois Artillery. They got around. In the meantime, Ducat turned back to the Highland Guard, following his old militia commander John McArthur into the 12th Illinois Infantry, a.k.a. the “First Scotch” regiment. Ducat was named regimental adjutant. By the time the 12th was engaged at Donelson, Ducat was a major, and just before Shiloh he was elevated to Lieutenant Colonel. After the capture of Corinth, Ducat garnered the attention of Brigadier General E.O.C. Ord, and served under that officer at Iuka. A month later, he was on Rosecrans’s staff at Corinth. He would remain a staff officer for the rest of the war. He would later express some disappointment over this change, since staff positions meant greatly reduced chances at promotion and higher command. 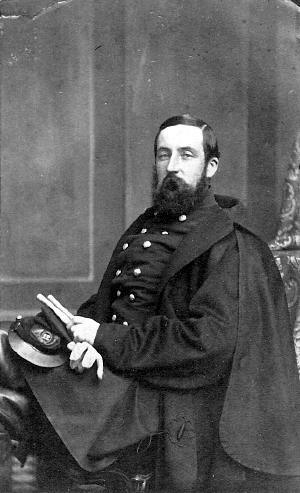 He excelled as Rosecrans’s Inspector-General. When Rosecrans replaced Don Carlos Buell in command of the Army of the Ohio, Ducat went with. Rosecrans descended on Buell’s old command like a whirlwind. The Army of the Ohio was in ragged shape, having completed the fall campaign in Kentucky and returned to Tennessee. The men needed just about everything. Rosecrans took note of it all, and immediately began improving the state of the command. Ducat proved invaluable in this labor. Ducat initially served as Rosecrans’s cheif of staff, at least until the arrival of Colonel Juluis Garesche. After that, Ducat returned to his duties as IG. He did everything from engineering work to helping re-organize the army. It was Ducat, for example, who created the Army of the Cumberland’s (renamed after Stones River) new system of corps, divisional and brigade flags, the better for identification in battle. He served with distinction on the field at Stones River, proving he still had the chops of a combat soldier as well as a staff officer. At Chickamauga, Ducat served with distinction. He was present at headquarters when the breakthrough occurred, but like most of the staff, became separated from Rosecrans at the critical moment and so did not accompany the General back to Chattanooga. Ducat helped rally stragglers on the Dry Valley Road, eventually falling in with Sheridan’s men and accompanied them to Rossville. After Chickamauga, Ducat stayed with the army, serving on George Thomas’s Staff when that officer replaced Rosecrans at the head of the Army of the Cumberland. Health reasons, however, forced Ducat to resign in February, 1864. He returned to Chicago to recuperate. Ducat was a shrewd observer with a keen military mind. Based on his surviving writings, his insights into the inner workings of the Army of the Cumberland would likely have been a great boon to historians. Ironically for a man who spent so much of his life in the fire-fighting and insurance business, most of his military papers were destroyed in the better-known Great Chicago Fire of 1871. Not everything, however. Ducat retained a lifelong loyalty to Rosecrans, and, according to his memorialist, retained “strong opinions” on the question of Rosecrans’s relief by Grant. Unfortunately (as recorded in that same memorial) “among General Ducat’s [surviving] papers were found some copies of Chickamauga’s field dispatches which have a personal as well as military interest, but as they deal with questions that might revive old controversies it has been deemed wiser to supress them.” To date, I have not discovered whether or not “supress” meant that they were destroyed or merely kept private. If the former, then the history of the battle of Chickamauga is just a little bit more incomplete because of it. After the war, Ducat returned to insurance, and continued to play a role in the world of fire-fighting. He kept his hand in on military affairs, being instrumental in the formation of the Illinois National Guard, which he later commanded as a major general. He also played a role in veterans affairs, joining MOLLUS, the Society of the Army of the Cumberland, and the GAR. He gave speeches and eulogies. One fascinating tidbit of his life – for me, anyway – was that he was the organizer and first captain of the Lake Geneva (Wisconsin) yacht club. Lake Geneva, about 80 miles from Chicago, has long been a resort community for Chicagoans, wealthy and otherwise, even Al Capone had property in Lake Geneva. I have visited Lake Geneva often, though admittedly, never been to the yacht club. Ducat died of pneumonia and heart failure at his estate in Downers Grove Illinois on January 29, 1896.